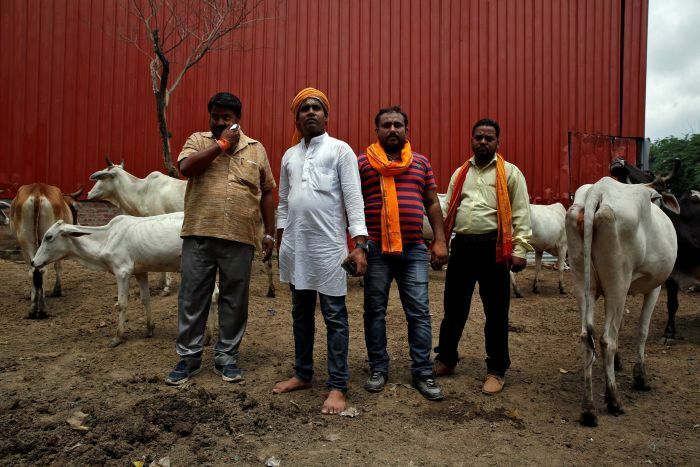 Modi’s Hindu nationalist Bharatiya Janata Party, which supports policies to protect cows revered by the country’s majority Hindus, have “increasingly used communal rhetoric that has spurred a violent vigilante campaign against. Cow slaughter is forbidden in most parts of Hindu-majority India. However, over the last few decades, Hindu nationalists have led a political campaign complaining that the authorities do not do enough to enforce the ban and stop cattle smuggling. Since beef is consumed largely by religious and ethnic minorities, BJP leaders, in seeking to appeal to Hindu voters, have made strong statements about the need to protect cows that have enabled, and at times may have incited, communal violence. Narendra Modi, when he was chief minister of Gujarat state and during the 2014 national election campaign, repeatedly called for the protection of cows, raising the specter of a “pink revolution” that he claimed had endangered cows and other cattle for meat export. After he was elected prime minister, Modi did not robustly condemn vigilante attacks by cow-protection groups until as late as August 2018, when he finally said, “I want to make it clear that mob lynching is a crime, no matter the motive.” In January 2019, he said these attacks did not “reflect well on a civilized society.” He, however, appeared to dismiss claims of growing Muslim insecurity as being politically motivated. In some of these laws where there is a shifting of burden and consequently a presumption of guilt, that should be very rarely used because it curtails fundamental liberties. The impact that it can have is that they can make certain professions such as that of transporters, butchers, leather workers, susceptible to the criminal process and the process itself ends up being the punishment in most cases. Instead of promptly investigating cow-protection attacks and prosecuting perpetrators, the police, in at least a third of the reported cases, have filed complaints against victims’ family members and associates under laws banning cow slaughter. Counter complaints against witnesses and family members have often served to make them afraid to pursue justice. In some cases, witnesses turned hostile because of intimidation both by the authorities and the accused. Vigilante attacks by cow protection groups and stricter laws on cow slaughter and transportation of cattle have disrupted India’s cattle trade and the rural agricultural economy, as well as leather and meat export industries that are linked to farming and dairy sectors.India is the largest beef exporter in the world, exporting buffalo meat worth about US$4 billion a year. However, after the BJP government came to power in 2014, exports have mostly declined. The leather industry has also been affected, with a government economic survey noting that “despite having a large cattle population, India’s share of cattle leather exports is low and declining due to limited availability of cattle for slaughter.”The government has authority to enact laws and policies restricting the buying and selling of cattle but, in doing so, need to guard against disproportionately harming minority communities and ensure that any such laws or policies are consistent with the right to a livelihood for all Indians. In July 2018, the Supreme Court in Tehseen S. Poonawalla & Ors. v. Union of India & Orsdirected central and state governments to publicly make statements and spread the message that “lynching and mob violence of any kind shall invite serious consequence under the law.” In response, the home minister told the parliament the government had formed a panel to suggest measures to stop mob violence in the country. “We will also bring a law if that is required,” he said. Clearly and unequivocally signal, through public statements and measures by senior state and high-ranking police officials, that perpetrators in mob violence cases, even those politically connected, will be fully prosecuted. Next articleThe IOC said it will not allow India to organise Olympic-related events in the future unless written assurances are obtained from the government. क्या सकारात्मक टास्क देने वाले गेम नहीं बनाए जा सकते?